I have said before how important it is to review your painting as you go. Stop. Take time to look closely at your work and make sure you are reasonably happy with the progress. Think about where you are being lead by the painting because in my case I find the painting sends messages about what and how to include various features. Don’t be frightened to erase and don’t be frightened to start again. So let’s review how our “Town” painting is progressing. Let’s think about what we want to achieve and the story we want to tell. Because I’m a genre artist I always strive to tell a story especially in my paintings of townships. Just like a good writer, an artist has to entice the viewers into looking at the painting and looking deeper into it to discover interesting features. So let's look at how we are going. Starting on the lower right side I noted that this corner which is the most important in the painting was going to be pretty uninteresting except for wondering if the precariously perched cottage on the corner was going to fall into the road!! I added a fence and we can do more with it later. I've added some steps for the people living above the road to use. Paintings like I do have to make sense. It's no good painting a beautiful little village and then realise the people couldn't get into their house. I've also added steps up to the little cottage down the hill on the right. For interest I'm thinking of putting in a bus stop which can have a seat and some people which will create a sense of story right at the front of the painting and create an expectation that these people are going to journey through the town and beyond. Remember we have to take the viewers along a story line if we are going to maintain their interest. 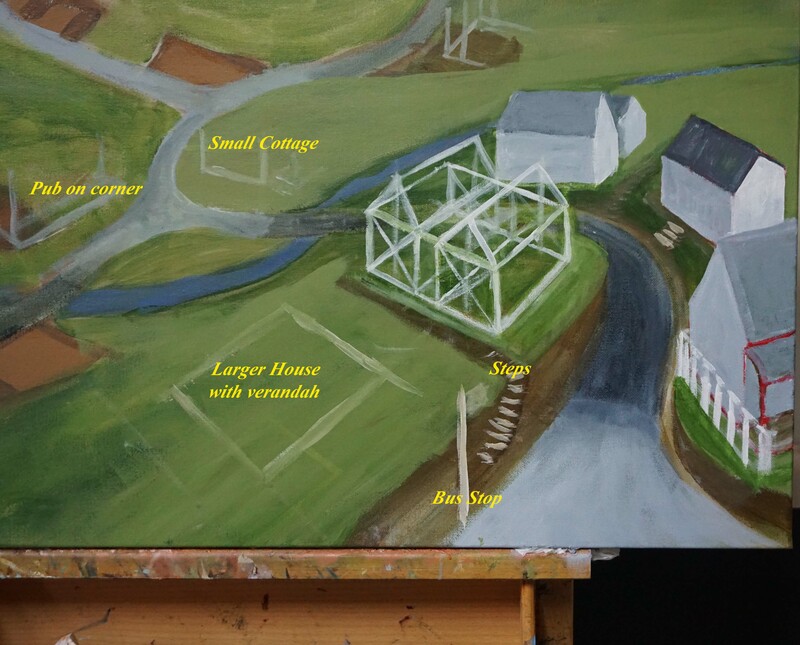 You can also see I have planned for a larger house on this right side which will be the most important building in the painting so we need to take time to think this through carefully. I have also placed in a pub (essential to all towns) and another small cottage opposite it.